I Felt a Funeral in My Brain research papers on Emily Dickinson's poetry about death. Poetry research papers are not easy to write, especially on difficult poems such Emily Dickinson's I Felt A Funeral In My Brain. Poetry writers can explicate Dickinson's poems for you in a custom essay today. “I felt a funeral, in my Brain” by Emily Dickinson is a psychological poem that is particularly bare in that it tells nothing about the situation which has brought about the funeral gathering. Characteristically, Dickinson is more interested in how the emotion is played out in the consciousness than in the origin of the emotion. The ending of the poem may be overshadowed by some other works that stress pain or power, however, it is free of judgments and is more explicit in merging an experimental state of consciousness with dying. In “I felt a funeral in my Brain”, the dying mind falls into a state which is neither heaven nor hell but rather somewhere which is beyond the realm of language. One of the most graphic elements of “I felt a Funeral in My Brain” is the recording of the soul’s final moments of consciousness and the terrible struggle away from life after a shattering separation from the body. Her poem explores every conceivable variation of pain, fear, misery, and loss that the human spirit can endure. With the detailed presentation of a complete funeral as felt through the ebbing sensation of a dead person, the poem borders on morbid by portraying the occasion of the terrible struggle that the separation of the body from the soul experiences. Dickinson uses the funeral service as much more than merely an exploitation for a sensational effect, but rather it has allegorical significance. The physical death symbolizes spiritual death and perhaps gives momentary insight into the nature of infinity. Likewise, the opening scene in which the mourners file past the exposed body before the actual funeral service is the mourner’s glimpse into the nature of death and infinity. The view of death is an oppressive view since they are living and have yet to experience death. Funerals - Funerals Research Papers deal with funerals as a process of closure. Poems About Death - Poems About Death essays look into one of the most frequently explored themes in poetry. Because I Could Not Stop for Death - Because I Could Not Stop for Death research papers by Emily Dickinson explicates the Dickinson's most famous poem. 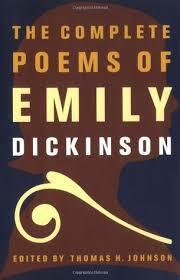 Romantic Era - With the exception of letters of correspondence, all of Emily Dickinson's published works are in the form of poetry. Death in Literature essays discuss the common theme of death in different works of literature. Death and Dying Research Papers examine a book by Elizabeth Kubler Ross that describes stages through which someone close to a terminally ill patient goes through. William Dean Howells - He also promoted American writers such as Stephen Crane, Emily Dickinson, and Sarah Orne Jewett. Death of Ivan Ilych - Write a critical analysis of “The Death of Ivan Ilych” by Leo Tolstoy. A Rose for Emily Theme - A Project on A Rose for Emily Theme, discusses the main themes of tradition and change, and death and how these two things have impacted the main character of Faulkner's short story. Order a research paper on A Rose For Emily from Paper Masters. Freedom or Death - Freedom or Death and explore Nikos Kazantzakis' contribution to Greek Literature. American Dream in Death of A Salesman - For American Literature, the quintessential "American Dream" story is Arthur Miller's Death of a Salesman. Death of a Salesman as Tragedy research papers look at the character of Willy Loman as a tragic figure in literature. Master and Man - Master and Man Research Papers look at a trip of a man and his servant to a distant village to purchase land. Death of a Traveling Salesman - Death of a Traveling Salesman research papers delve into the story, written by Eudora Welty, that takes place inside the mind of a traveling shoe salesman. Snow of Kilimanjaro - Ernest Hemingway’s 1936 short story The Snows of Kilimanjaro is one of the most frequently critiqued works of fiction in the author’s prodigious oeuvre. The Book Thief by Markus Zusak - The Book Thief, narrated by Death, is about a girl, Liesel Meminger, fostered with a family outside of Munich during World War II. Paper Masters writes custom research papers on I Felt a Funeral in My Brain, Emily Dickinson's poetry about death.